Two cakes from DaliCakes were featured in the fall issue of NJ ICES magazine. Great achieve! ICES is the International Cake Exploration Societé (ICES). ICES is an international organization that serves over 4,000 registered members from around the world. 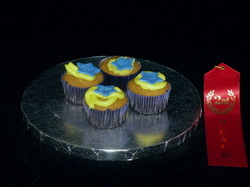 Dali won first and second place in two categories at the recent Garden State Cake Show Contest, February 2011. Below are the winning cakes. Thank you for your great support! The "Godzilla Cake" placed as a top five finalist between thousands of contestants in the US for the "Creative Cake Contest" from "Cookie Magazine", in September 2009. Everything about this cake was such a pleasant experience! Below are the comments received during the "Cake Creative Contest" of Cookie Magazine. Thank you for your support! 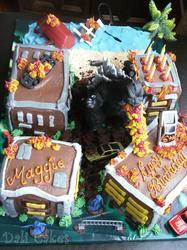 "Kudos to all the decorators... As Maggie's Mom, I have to say my favorite is Godzilla Cake. The cake looked like a stage set from the start and then as it was cut and eaten, the destruction added to the theme of the cake. It was so much fun to help Godzilla destroy the city one building at a time. I have never seen kids enjoy a cake so much! Oh, and it was delicious too. Congrats to all of you, I am officially inspired!" 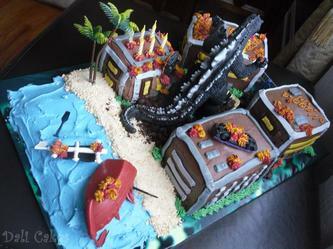 "I love the Godzilla Cake! The cake is extremely creative." 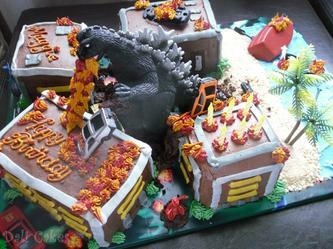 "My vote is for the Godzilla cake; my boys would be thrilled to have a birthday cake like that! Also, the mom who made this one used her own creativity, without any idea help from magazines, books or other cakes that she saw." " I love the GodIlla Cake from Dali Betin-Moromisato, Hamilton, New Jersey. My boys would love that cake!! It is so fun AND creative. The frosting flames are the best!" "Godzilla cake is so cute & scary. My vote goes out for this cake!!!" " I LOVE Godzilla and I think it's cool to have toys mixed in with food. What a great way to have something leftover from a theme cake after the edible parts are gone. This is about creativity, right?" " My vote is for Dali... from Hamilton, NJ. The Godzilla cake ROCKS!! I've never seen anything like it! That one is a true winner!" "I think the Godzilla cake should win. It's very creative and fun." Copyright © 2009-2013 Dali Cakes. All rights reserved.